Madagascar 3: Europe’s Most Wanted features all of our children’s favorite furry characters (Yes, even the penguins) on an epic adventure involving circus acts and a trek around the world. Despite the epic nature of the adventure, Alex the Lion, Marty the Zebra, Gloria the Hippo, and Melman the Giraffe really just want to make it back to New York City. Whether or not they make it will have to be determined when Madagascar 3 hits 3D Blu-ray, Blu-ray, and DVD on October 16. Animated films often roll with wild premises that would not work nearly as well in a realistic backdrop. That being said, Madagascar 3 has one of the most over-the-top premises I’ve ever seen. Never mind the talking animals, this movie has our heroes evading animal control officers and joining the circus. The movie doesn’t always work, but it’s never lacking in excitement. It stands to reason Paramount Home Media Distribution would want to keep up the excitement level when it comes to extras on the disc. 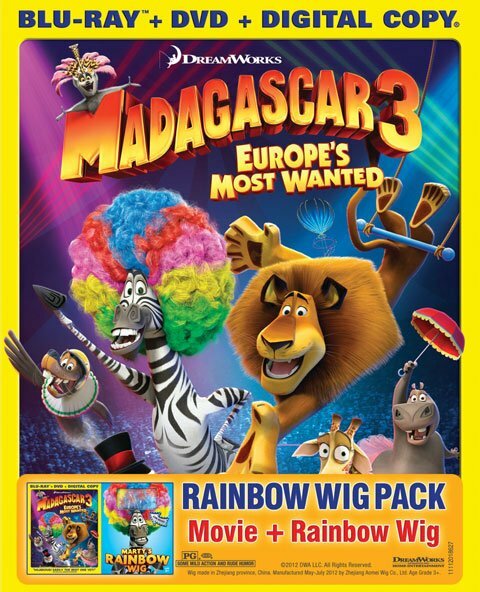 The upcoming Madagascar 3: Europe’s Most Wanted set looks like it won’t disappoint. There’s stuff for the grown-ups, like filmmakers commentary, and some deleted scenes and other fun stuff for the kids. Blu-ray copies will come with a couple of additional bonus features—and a pack of rainbow wigs to get your circus on--but there’s a pretty big price jump, so you should weigh the pros and cons of how much you and your kids really want to own an HD copy of the flick. You can check out the full list of extras below, or pre-order the movie over at Amazon.